Electricity plays a much larger role in all our lives today. It seems like everything I own has a battery. There’s an electric car charging station at my favorite hotel in Savannah, Georgia. The new versions of the board games my children play all have batteries. My wife has an iPhone. I live on my iPad. Heck, even my dog wears a battery-powered collar for the electric fence. On the surface, my life seems to be much more electrically intensive than it was a decade ago. I know I’m not alone. My parents changed similarly. So did all of my friends. According to the Energy Information Administration (EIA), total end use of electricity grew just 0.2% per year from 2006 to 2016. That includes transportation! Industrial demand fell 0.3% per year over that period. I spoke to an executive from my local power company. He told me that modernization of the big energy consumers, like televisions, air conditioners and refrigerators, is the reason. Over the past 20 years, air conditioners saw a 250% increase in efficiency. It took about 6,000 watts per hour to cool an average-sized house then. Now it takes about 1,710 watts per hour. That’s a massive decrease. In 2017, U.S. retail electricity sales fell by 80 billion kilowatt hours. That’s the most since the recession in 2009. That’s mostly due to weather. The cooler summer across the U.S. required less air conditioning. That’s reflected in the sales. 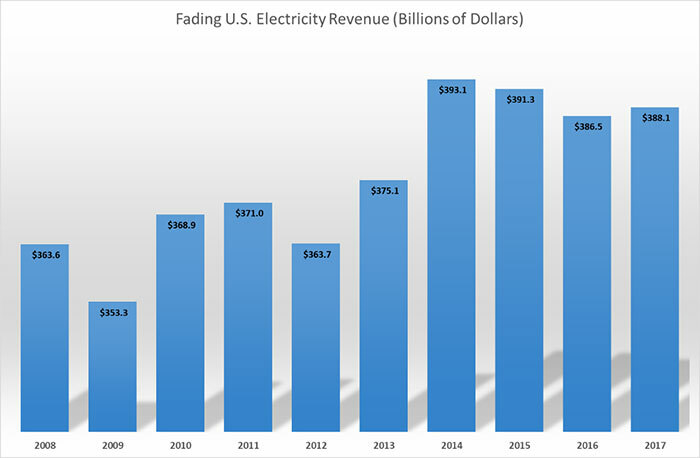 According to EIA data, electric power revenues peaked in 2014. They are down 1.3% since then. That’s what led to the recent bankruptcy of FirstEnergy Solutions. It’s a subsidiary of FirstEnergy Corp. (NYSE: FE). Akron, Ohio-based FirstEnergy Solutions owns and runs coal and nuclear power plants in Ohio and Pennsylvania. The company and its affiliates owe more than $3.8 billion. The problem is that these power plants are not competitive in today’s power market. That’s a symptom of a larger trend — coal and nuclear power plants closed all over the U.S., from 2012 to 2016, 14 reactors shut down. Since 2010, 268 coal power plants shut down. Several more will shut down in 2018. The takeaway here is that utilities are a tough industry to make money in today. Still, utility stocks are popular among income investors. They are big, stable businesses that usually pay steady dividends. In other words, ideal freedom checks companies. However, there are much better places to get freedom checks today. The utilities sector is in transition right now. You can see that reflected in the stocks. The Utility Select Sector SPDR ETF (NYSE: XLU) returned just 1.3% over the past year. It’s down 3.8% so far in 2018. This is a sector that we don’t want to put money to work in right now.